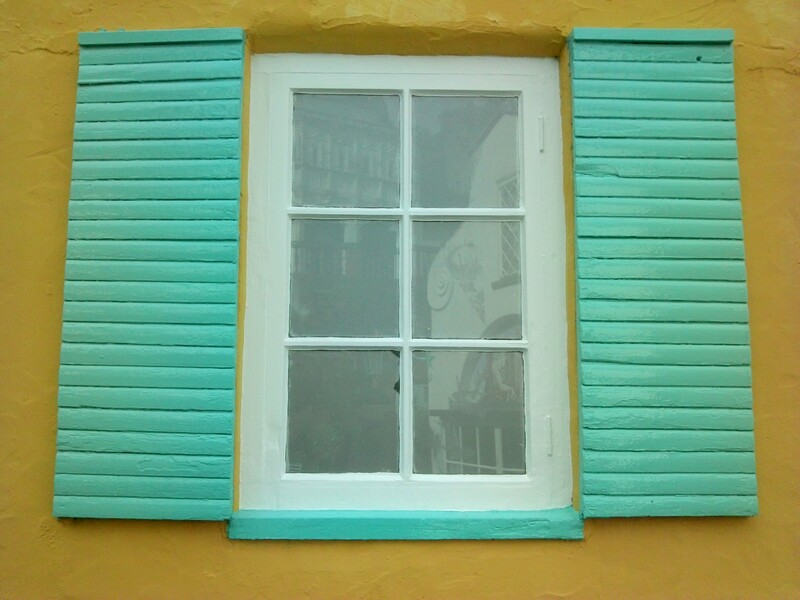 Here’s Another One I Made Earlier….. In the previous post I introduced the collaborative photo-shoot I worked on recently with Emmie Miles Bespoke Dressmaking. The second dress Emmie designed was a 1930’s style silk satin gown with a train and feature embroidery on the waistband at the front. It had a soft, regal and feminine feel to it and I decided I wanted to make a vintage diamanté tiara to go with it. I don’t usually do sketches for my work, I just respond to the materials and play around with mock-ups, trying out different compositions with a variety of different pieces of vintage jewellery, until I find one that feels right. The first piece I made featured vintage 1920’s and 30’s jewellery but it was not quite right for the dress, too heavy and geometric. So I tried again, and picked out a selection of diamanté flower brooches that reflected the softness of the embroidery, and had a slight blue/pink tint to some of the stones which worked well with the soft pink silk of the dress. 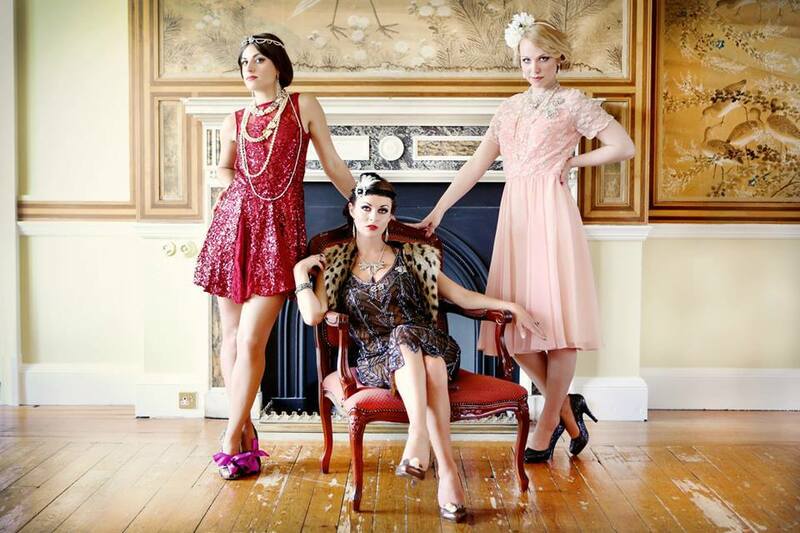 For the photo-shoot Harriet styled and set Anne’s long hair in a 1930’s movie star do. Overall, once the dress and tiara were on, Anne looked like a glamorous screen goddess! The dress is the ‘Vera’ by Emmie Miles Bespoke Dressmaking & Design, hair by Harriet’s Organic Hairdressing, make-up by Aine Thomas. 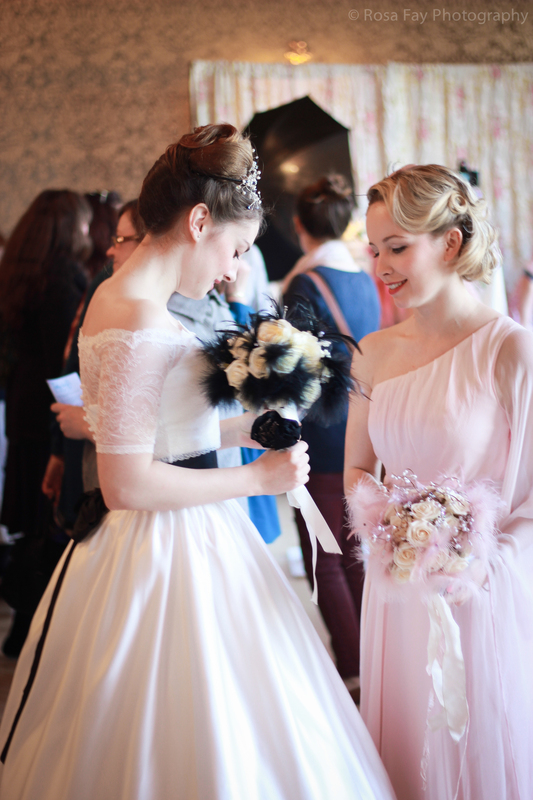 And of course the photos are by the very talented wedding and portrait photographer Camilla Reynolds. I was contacted earlier this year by fashion designer and dress-maker Emmie Miles to provide hair accessories for her to use in a bridal photo-shoot. Emmie was in the process of designing and making samples for her latest bridal wear collection, I saw the sketches and loved what she was doing, and instantly envisioned what hair pieces I could make to compliment them. There were 3 dresses, and the first to take form was an ivory silk 1950’s style wedding dress, with pearl and bead embellishment on the front. I wanted to make a 50’s style pearl bead and crystal fascinator with veil, to compliment the detailing Emmie had done and fit in with the vintage feel. I made the frame first, to the shape and size I wanted, and covered it in knitted wire. 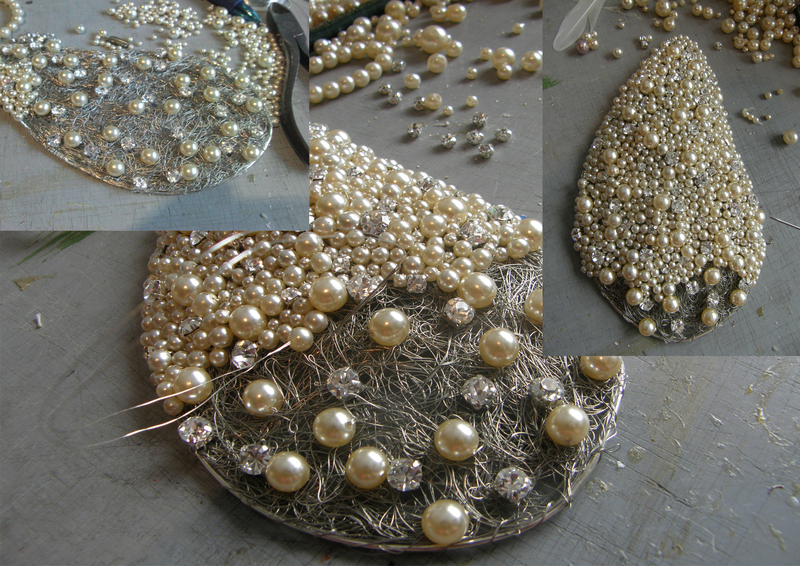 Next up I sewed on the biggest pearl beads and crystals. I wanted to cover the entire piece, but to keep it a random mix of different sized beads – I was using vintage pearl necklaces, which varied slightly in colour. It soon became apparent this was going to take a long time! So I spent a few hours a day on it, and……15 hours later…….it was finished! So here it is modelled by the beautiful Uta, looking every inch as elegant as Grace Kelly! 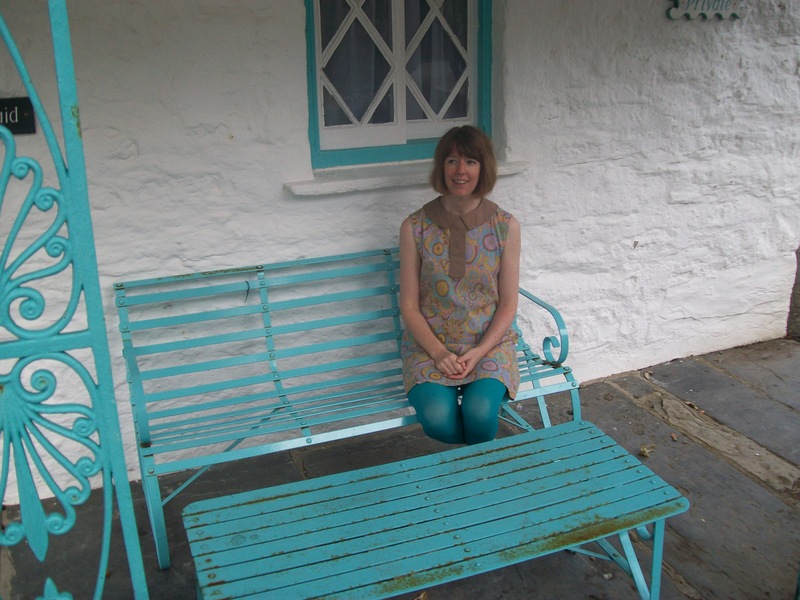 The dress is the ‘Emma’ by Emmie Miles Bespoke Dressmaking & Design, hair by Harriet’s Organic Hairdressing, make-up by Aine Thomas. 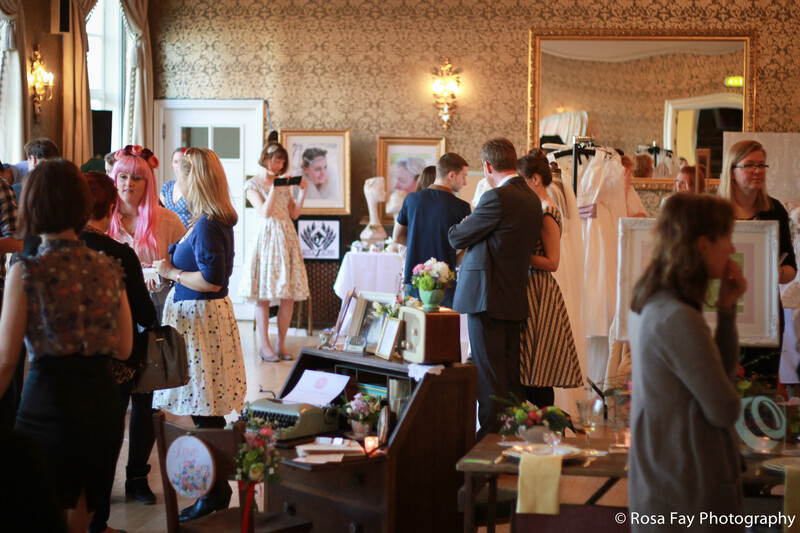 And of course the photos are by the very talented wedding and portrait photographer Camilla Reynolds. I have lived in Stroud for 10 years now, and feel very lucky to have settled in such a beautiful, vibrant and creative area. 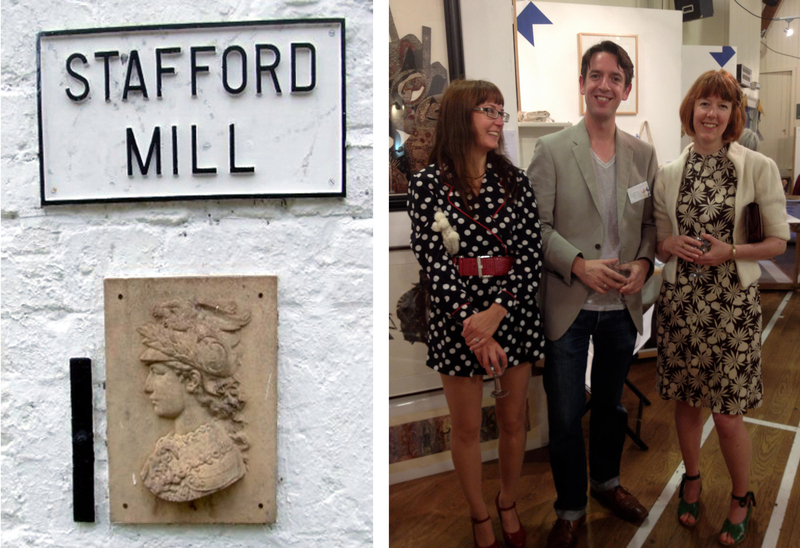 Nearly everyone you bump into is an artist or maker of some sort, or closely related to one. There is a strong history of the textile industry with many old weaving and spinning mills, often built by the river Frome to make use of water power, and some of those that survive have been converted into offices or studios, including Stafford Mill where I have a studio alongside my sister Victoria of Studio Vee, and fellow Winchester School of Art graduate Nick of Leto & Ariadne. In the month of May, over two weekends, many of these artists and makers throw open the doors of their work spaces for the SIT Select Trail and SVA Open Studios. Having taken part and opened our own workshop for the last 4 years, this time we decided to opt out and visit some of the studios we have heard so much about but never been able to get to! Way back in September I visited a place I’d wanted to see for a while……continuing on from the colour theme as it’s somewhere that colour takes centre stage. Portmeirion Village was the vision of one man, Clough Williams-Ellis, and was built between 1925 – 1976, using a mixture of historical buildings and monuments, many of which were rescued from demolition in their original settings, so that Portmeirion is often referred to as ‘a home for fallen buildings’. 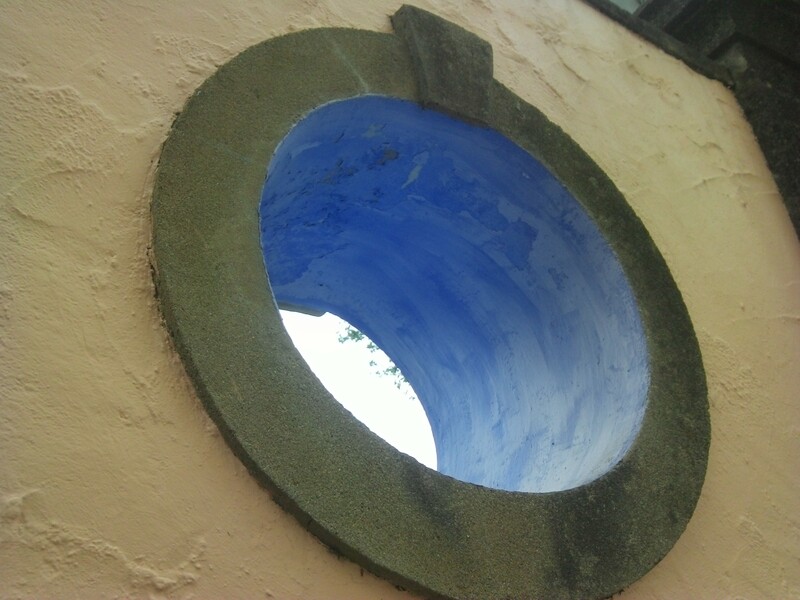 Inspired by the architecture of Mediterranean towns such as Portofino, Clough Williams set out to create a tightly set village in harmony with the landscape. 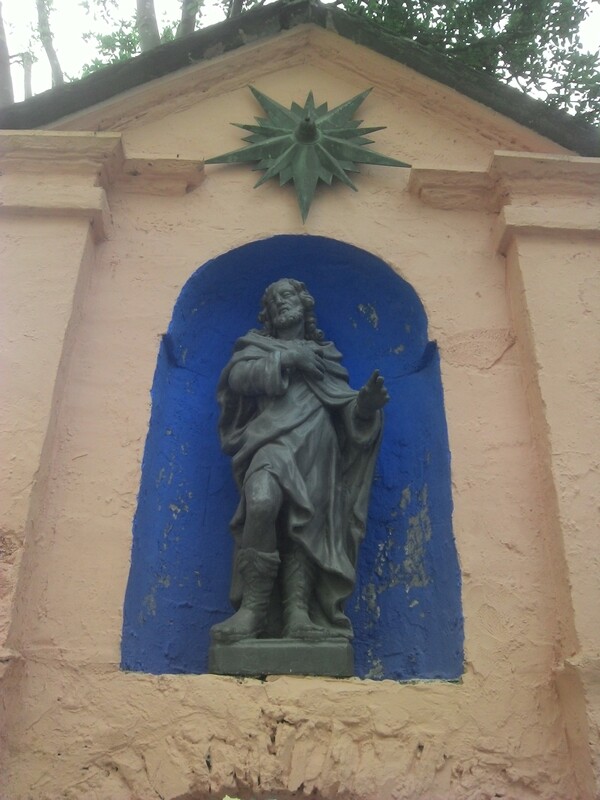 Many of the building’s walls and gates are painted in a specific colour scheme, shades of terracotta, yellow, peach, turquoise and blue, which adds to the Mediterranean feel, and the colours are used to great effect to pick out details, including ironwork, window frames and mouldings on the buildings. 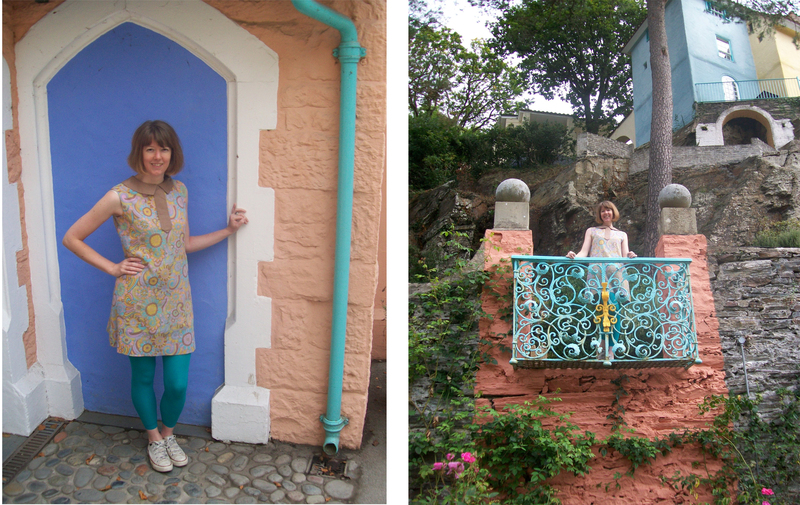 I didn’t know it til we arrived at Portmeirion, but it turned out my chosen outfit of vintage paisley mini dress with turquoise leggings, was a perfect complement to the painted architecture! 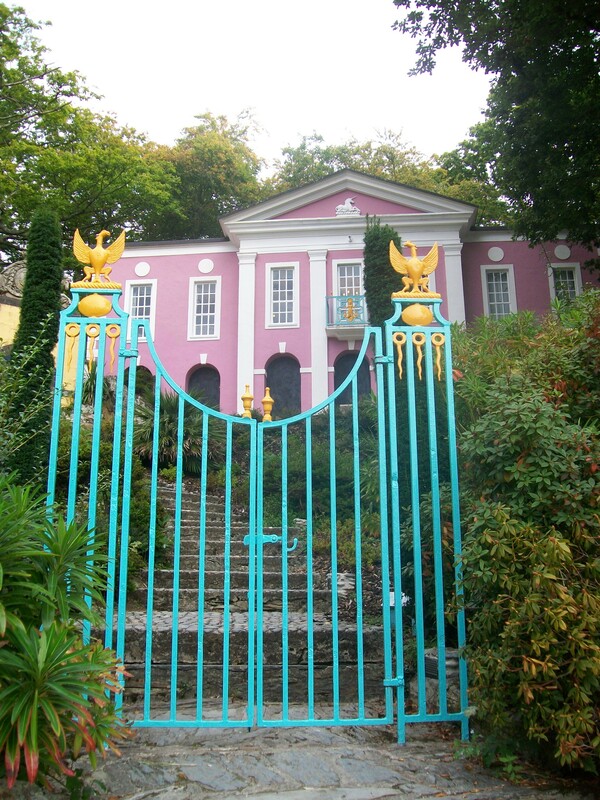 We arrived at Portmeirion just as it opened so were lucky enough to have the place to ourselves for the first hour, and enjoyed the peaceful tranquillity of the place. It certainly sits well in the landscape and the colours bind it all together, bringing harmony to an otherwise mis-matched collection of structures. 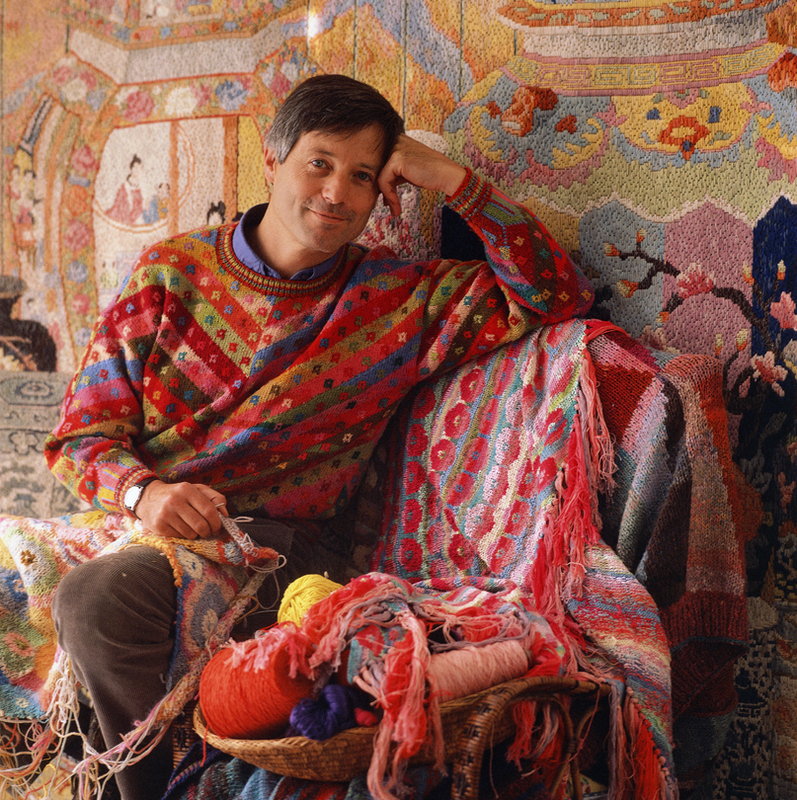 I remember when I was younger seeing knitting patterns and tapestry kits for these amazing, colourful designs by an American guy with a funny name……when I went on to do textiles at school he popped up again in reference books and source material…… he was well regarded and influential, and continues to be so now, at the age of 77! 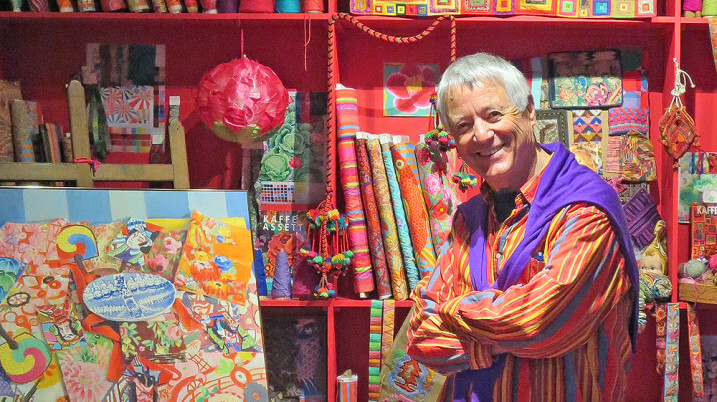 He is a world renowned textile designer and knitter, originally from California, he came to the UK in the 1960s, he is Kaffe Fassett. 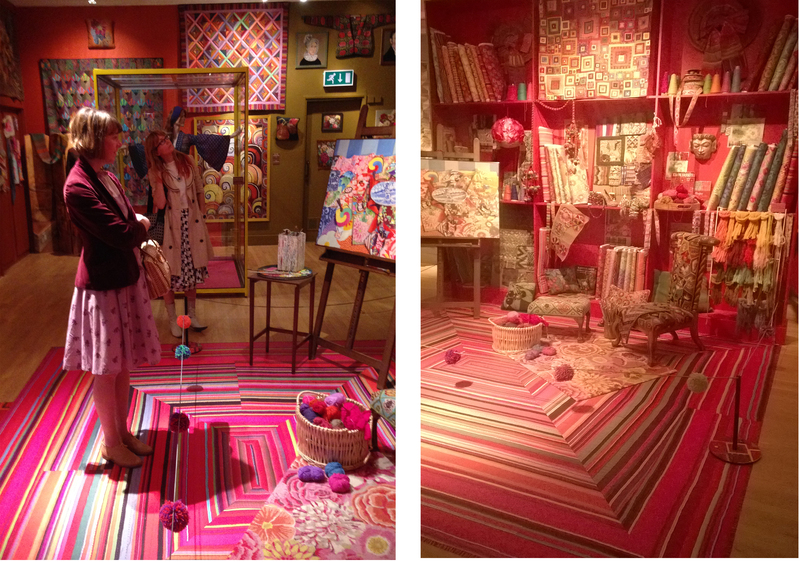 And so it was that on a recent trip to Bath I, along with studio buddies Victoria & Nick, went to the American Museum in Britain to see the breathtaking exhibition The Colourful World of Kaffe Fassett. It was beautifully presented, all the walls had been painted in bright colours, the displays included personal ornaments and ephemera, to show what influenced his work, and they had recreated a corner of his studio, an area that I stood in front of for a good 20 minutes just taking it all in! Admiring the studio set up. 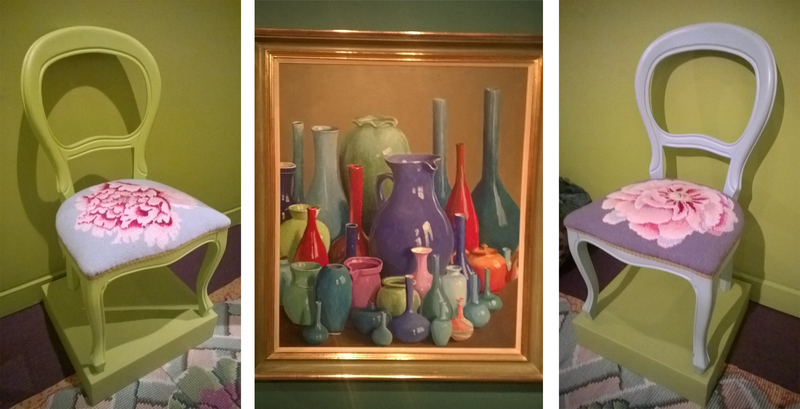 So may visual references, such vibrancy and playful use of colour. We all came out uplifted and inspired, not least by his obviously great enthusiasm and passion for his work. ‘This is the grandest show of my career – every item is part of an intricate opera of colour. I have always wanted this approach to my work, but other museum designers and curators have steered me to a rather mixed approach in my exhibitions. This show is so unique to me because it explains in a visceral way my growing obsession with the power of colour. My hope and conviction is that this exhibition at the American Museum in Britain will show the grey and beige clad young the sensual thrill of pure colour. I still feel vital! 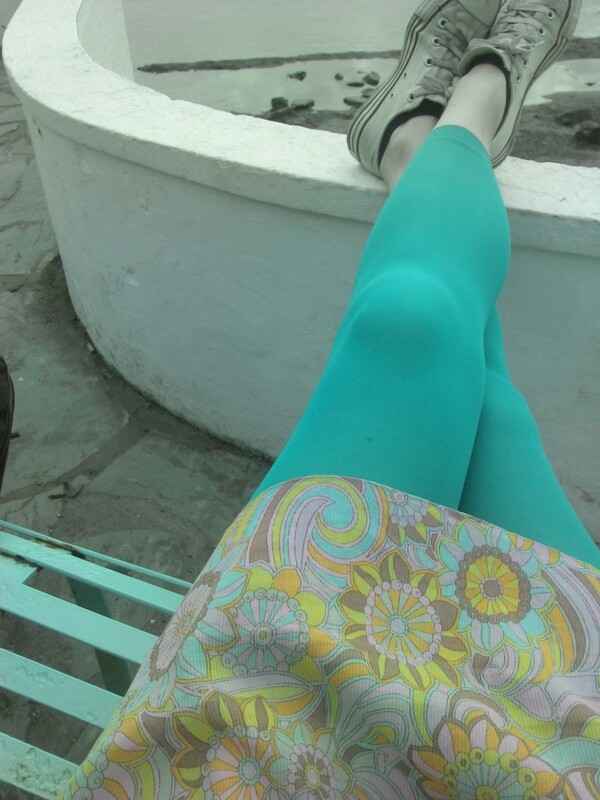 I want my message to come across in this mood altering show – I’m flying high on colour. The exhibition is on til the 2nd November. If you get a chance to see it, don’t hesitate, go! Now it’s a well known fact that the English like their tea! And I’m no exception. So, a while ago I was inspired, partly by this obsession and partly by the Mad Hatters Tea Party theme, to make some hair pieces with miniature tea sets. Placed on gingham check fabric to look like a table top and trimmed with vintage lace. They have sold steadily through Made in Stroud and worked perfectly in my Bristol stockist Cox and Baloney as they have a vintage style tea room! I was contacted a couple of months ago to make a bespoke tea set fascinator for a wedding guest, she is an actress, her partner is a poet, and they both enjoy dressing up. The brief was to use a purple and white check fabric base (to match with the purple bridesmaids dresses) and a pale coloured tea set. 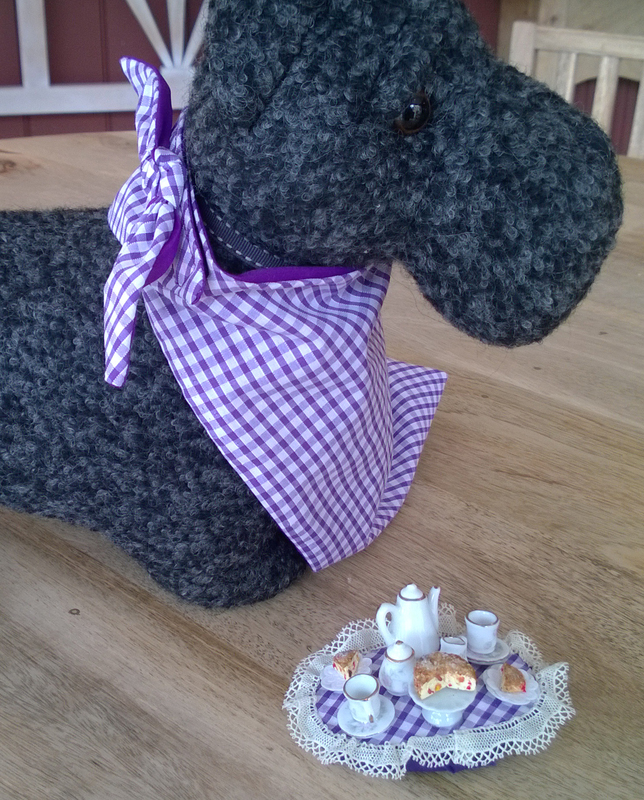 After the first meeting we decided to make a matching bandana for her dog Merlin as well, using the same gingham check fabric. The design evolved to include some cake too, on a miniature cake stand and slices served up on little side plates! 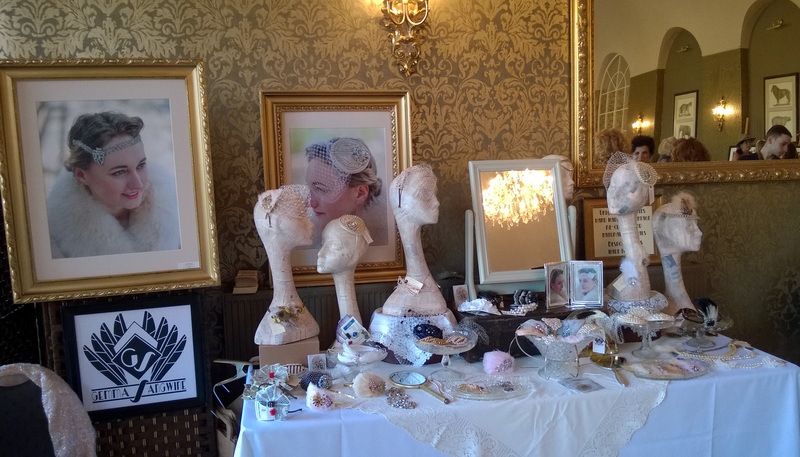 The last few months have been focused on making new bridal pieces for the Bristol Vintage Wedding Fair. So focussed in fact that as I packed up the new stock at the studio I just kept finding more and more of it, pieces that I’d made and had then melted into the background as my workbench turned into a creative frenzy of sinamay fascinator bases, feathers and vintage costume jewellery. I had a great day, as always with these events it’s refreshing to get out of the studio, show off my wares, get feedback from the public, and bond with fellow makers and fans of vintage. The venue was beautiful too, the Clifton Pavillion in the grounds of Bristol Zoo! 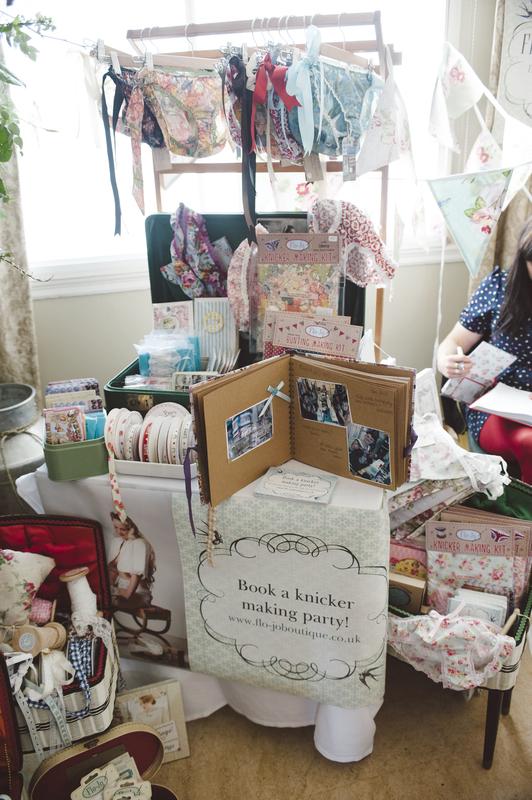 A special mention to Delia of Flo-Jo Boutique, who was there with their knicker making kits (great for hen parties!) 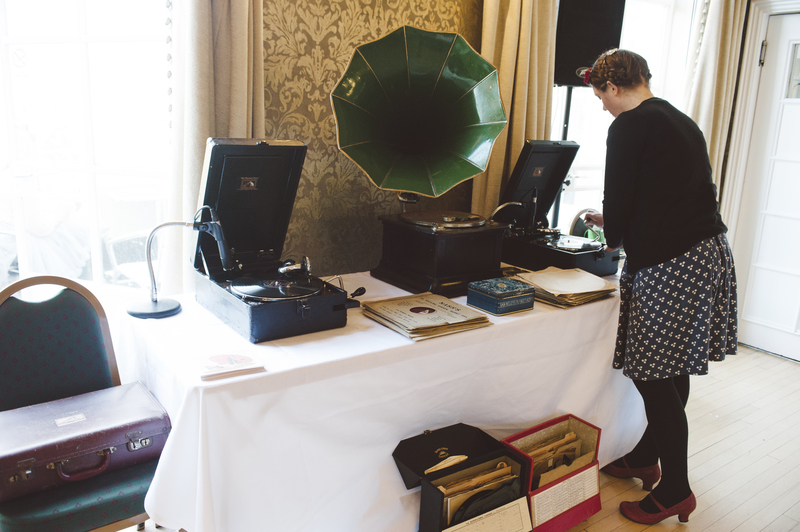 Kate and Matt of Shellac Sound who added to the entertainment with their array of wind-up gramophones and collection of original 78s from the 1920’s, 30’s & 40’s, Jessica Charleston with her stunning couture wedding dresses, and Adele of Tin Can Floral artisan florist. For the last few weeks I have gone back to school….every Wednesday I have been attending a Millinery course at New Brewery Arts in Cirencester. Along with my fellow students (all women, average age around 50…) I’ve been learning how to block simple cocktail hats and fascinator bases, how to stiffen and finish them, and how to make head bands with millinery wire. I am glad to be finally overcoming my fear of ‘blocking’ as I already have a sizeable collection of fascinator and hat blocks, which have been sat on a shelf in the studio quietly mocking me, as I find a myriad of excuses (not enough time, not the right fabrics, just need another cup of tea..etc..) to continue to buy in pre-made bases to decorate as and when I need them. Now I’ve taken the plunge to learn how to make them myself and I see a whole new world of creating opening up before me…..the most exciting of which is to be able to make the shapes in buckram and then cover them in some of the lovely vintage fabrics that I have hoarded over the years, pretty printed silks, soft woven tweeds and felted woollens, trimmed with velvet and lace. Millinery is a very satisfying methodology to learn, it’s like a key to another world, there are tried and tested techniques which have remained the same for centuries, and once the basics are covered you are free to defy gravity with up-ended shapes, giant brims, and precarious perchers, all of which start life pinned to a wooden block and gently stretched, moulded and teased into shape. 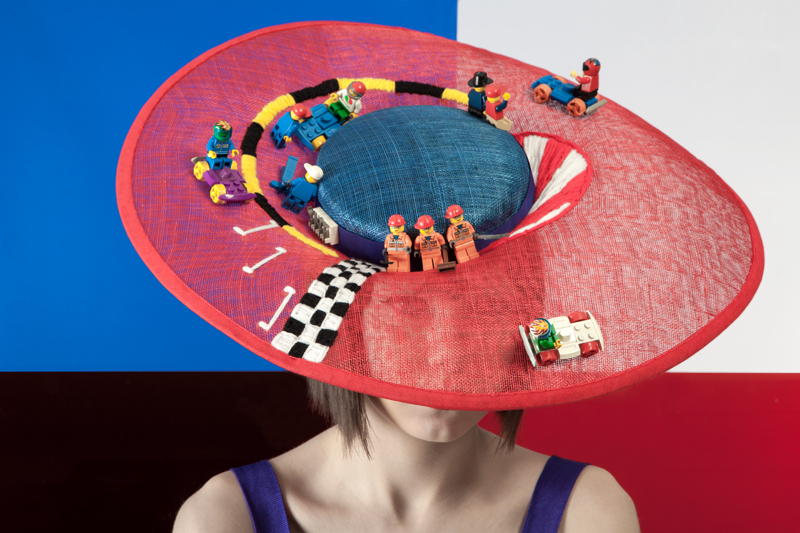 One designer that caught my eye recently is Monique Lee, with her utterly charming and unexpected use of lego in millinery. A case in point of how you can take a traditional, old fashioned craft and subvert it, the hats are technically superb and creatively insane… and I love them! Firstly, Happy New Year to you all, and thanks for your support and encouragement throughout 2013. It’s been a while since I last wrote anything on here. The last few months have been a busy time, with lots of stock and orders to make for Christmas. The Flapper style headbands have been selling well through As Long as it Sparkles, my stockist in Stow-on-the-Wold, and at this time of year I make upcycled felted woollen snoods and arm warmers which are popular at my local outlet Made in Stroud! I also had a commission to do for a bride-to-be whose wedding was at the end of October. 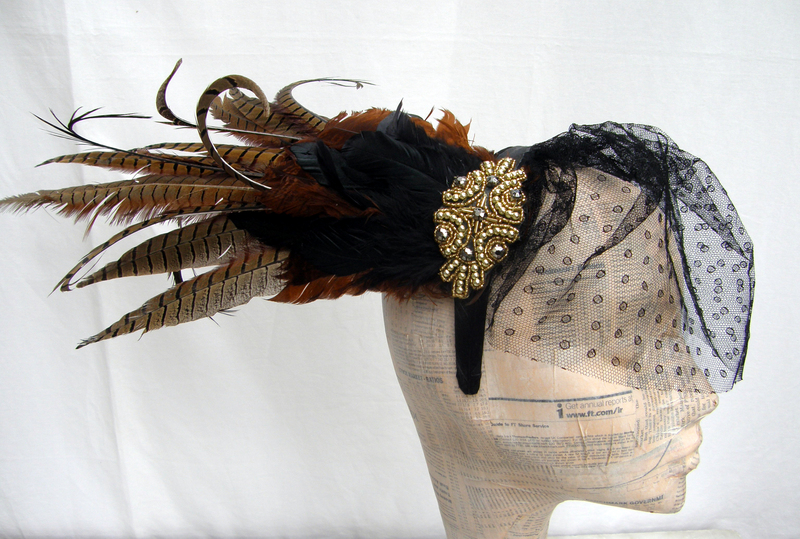 She had seen my fascinators in Cox & Baloney in Bristol, and wanted a feather piece with diamante jewellery and a veil. The overall colour scheme included orange and green, which we tried to include without looking too garish, and I’m glad to say we succeeded! The Pheasant feathers have natural orange and brown tones, and I picked out a green diamante brooch which mixed in well with the other vintage jewellery. 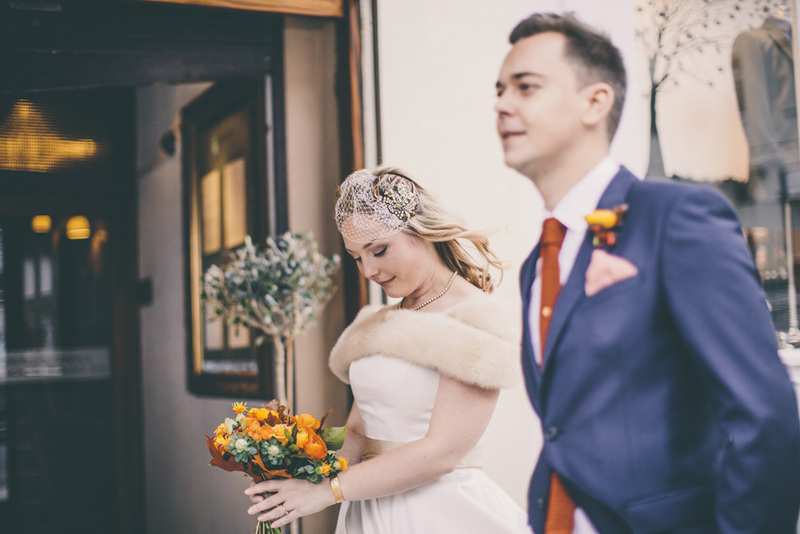 I was so pleased to receive these photos of the big day, they were so relaxed about the whole event, it was a pleasure to work with Clare and I love the autumnal feel of her outfit, with the fur trim on her dress, very elegant, soft and feminine. 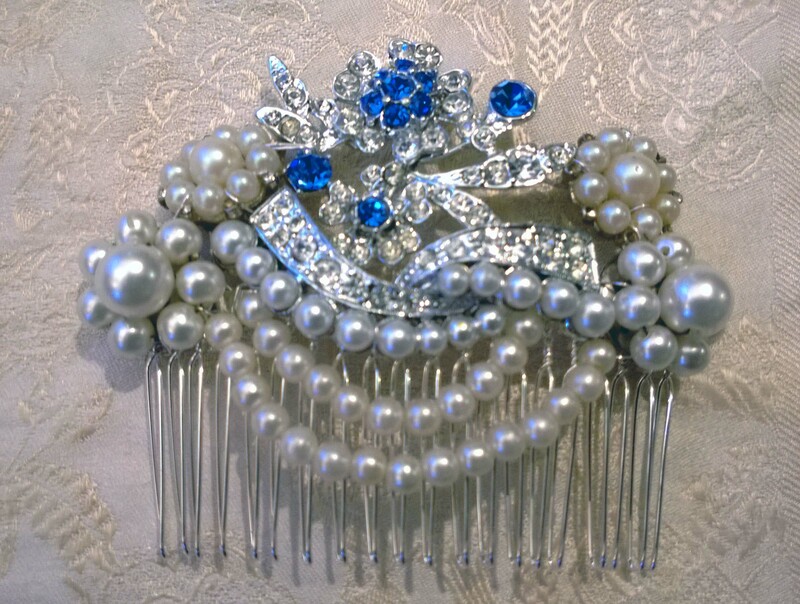 I had another, last minute commission for bride who was getting married on the 27th December, and wanted a hair comb with pearls (to tie in with detailing on her dress), diamante, and a bit of dark blue (to tie in with her bridesmaid’s dresses). I took a quick snap of the finished piece before I sent in on it’s way, and look forward to seeing the wedding photos soon! No matter how much planning I do, or how much time I have, I always seem to thrive on creating work in a crazy flurry of productivity right up against a deadline…it’s like being an art student all over again! I was recently commissioned to make two bespoke head pieces for Ali and Becky, who were organising a charity fundraiser Masquerade Ball and wanted unique pieces to wear for the event. Becky came about 3 weeks ahead of the big day, with an idea in mind and part of a vintage fascinator made with long pheasant tail feathers, for me to incorporate into a new piece for her. 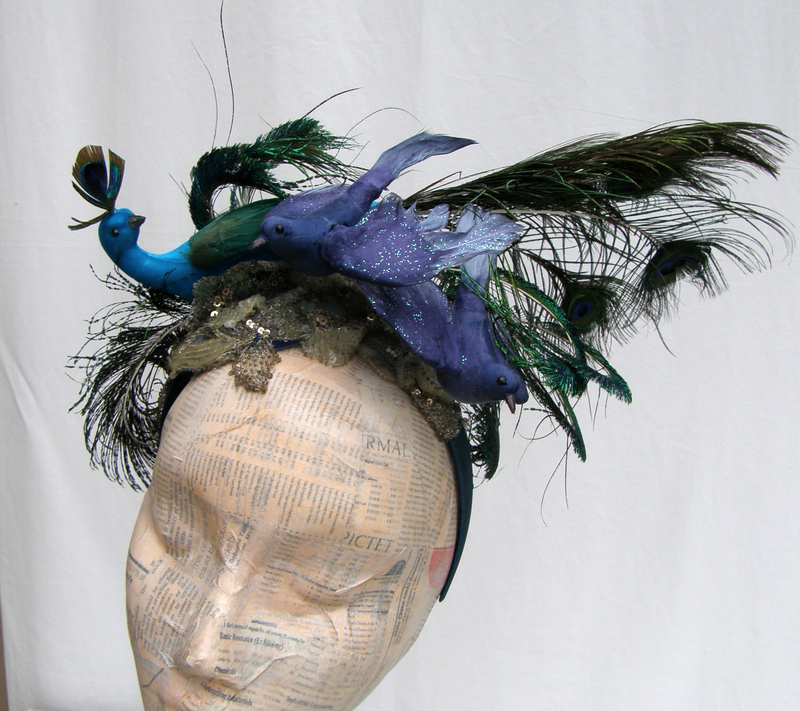 Above; Becky’s finished head piece. I added more pheasant tail feathers, stripped and curled some of them, added iridescent black coque feathers, a bejewelled placement and some antique netting from the sleeve of a (cut-up) vintage dress. Ali however didn’t make it to my studio until a week before the event……luckily I knew she was thinking of using peacock feathers as a starting point, and I had coincidentally picked up a handful of plumes from an antique shop in Bristol that week. We searched online for inspiration and decided to go for artificial birds, feathers and a bit of sparkle, lots of fun and a bit bonkers! I continued to search online for materials and sourced some lovely artificial birds, including a peacock, from Abercorn & Co. By now it was the weekend, and I was busy with a stall at a Vintage fair in Bristol all day on Saturday, and spent most of Sunday at a big antique & flea market. Come Monday I was tired, head buzzing with ideas and things to do, and I was still waiting for the artificial birds to arrive! On Wednesday the birds came, I unpacked them with trepidation…would they be as nice as they looked online? How was I going to incorporate all of these elements into a cohesive design? Well, there is one thing I have learned from working with vintage and ad-hoc materials, you can have an idea in your head of what you want it look like, but at the end of the day the piece just evolves and comes together in its own way. 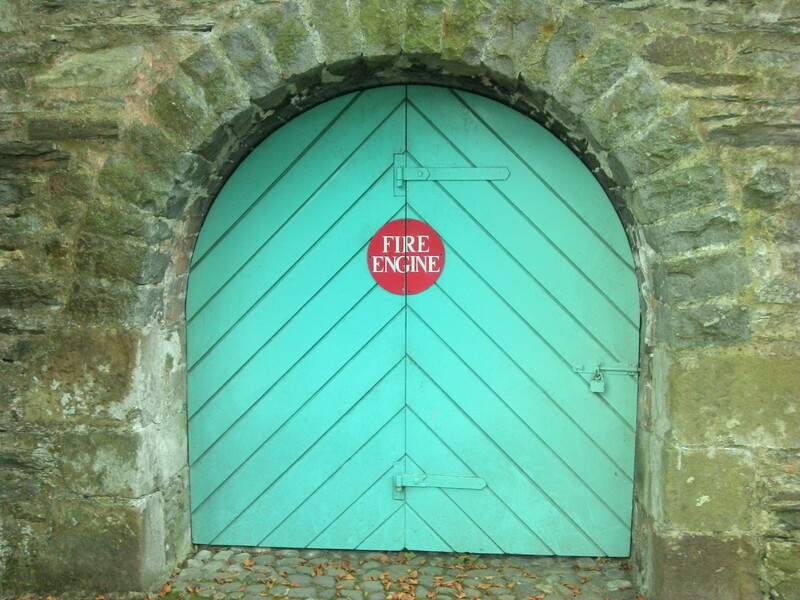 You respond to the materials and see what works together through trial and error, and a bit of intuition. What looks good on the mannequin can look unbalanced or odd when you try it on, so materials have to be pinned and clipped, tried on, and then stitched or glued together. I made it to the Ball too! Here I am in a lovely 1920s dress with a mask I made for a Christmas party a few years ago (dusted off and brought out for another spin!). 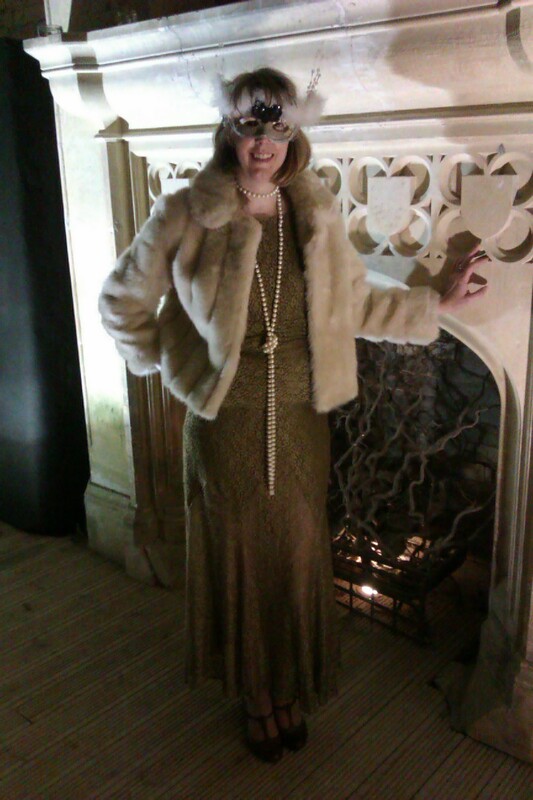 The event was held in the stunning, gothic Woodchester Mansion, to raise money for Medicene sans Frontiere. 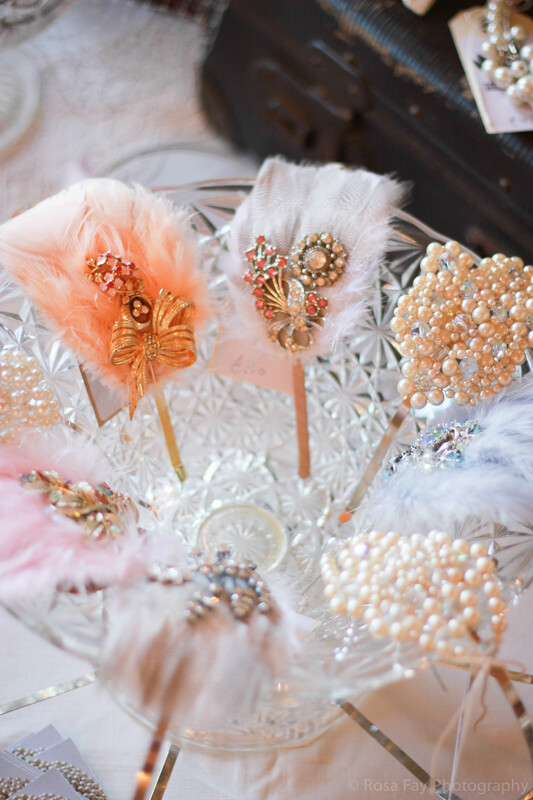 I’m glad I got to see my head pieces in their moment of glory, it was great to see Ali and Becky dancing away, I could follow the gentle swaying of long feathers as they moved around the rooms and interacted with the guests. My heart beat a little faster. I had just finished a commission for a 1920’s style bridal hair piece, and my head was buzzing from the stunning costumes and visuals in Baz Luhrmann’s The Great Gatsby, this was going to be fun! Two weeks later, on a sunny Sunday afternoon, and I am driving through the gorgeous Cotswold countryside to deliver an ordinary looking shoe box filled with a secret treasury of vintage pearl and diamante necklaces, feathers and marcasite brooches, all re-worked and transformed into flapper style hair pieces for the photoshoot. I am so excited to see the first images from the shoot, they feature clothes, accessories and jewellery all available from As Long as it Sparkes, and I will be tweaking the sample pieces I made to produce a range of hair bands which will also be available in the shop. 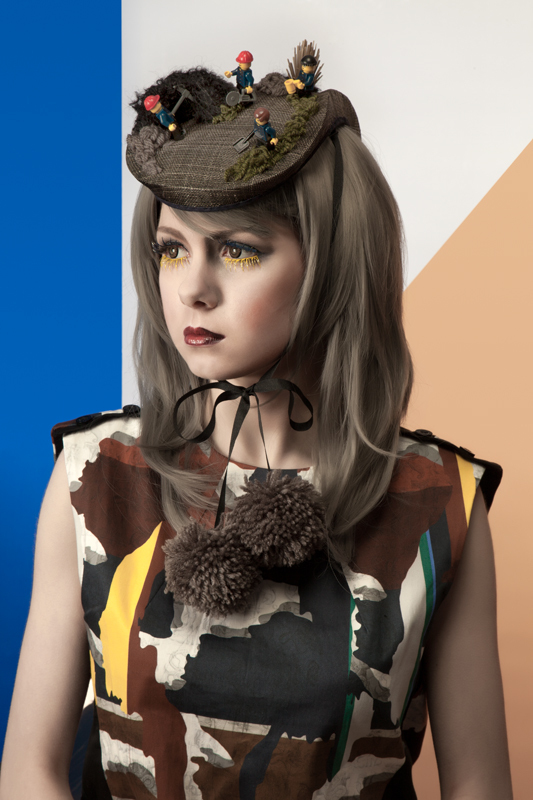 But mostly it is great to get styled images, with beautiful hair and make-up, to show off my work at it’s best!